Caring about what we eat and where it comes from has changed my perception about many things. It also brings me around to some great farmers markets. Even when we are out of town I love to experience the foods that are grown locally. In my own kitchen; I've noticed that there are a few vegetables that I prepare the same way. As an example; butternut squash is most often roasted. This week at the farmers market we sampled grilled butternut squash bruschetta. The samples were made by Chrysa Robertson the chef and owner of the Rancho Pinot Grill. I have written about her restaurant here before. She also receives her veggies from the same farmer and was showcasing his veggies along with her culinary talents. The squash was tossed with a red wine vinegar mixture and then left to marinade. I was intrigued as this is something that I have never tried before. Then to add even more flavor garlic is roasted and then mashed into ricotta cheese with fresh herbs and lemon juice. The end result was very flavorful. Combine olive oil, vinegar, honey, rosemary and garlic, toss with sliced squash, marinade 2 to 8 hours. Peel and discard most of the papery outer layers of the whole garlic bulb. Cut top about 1/4 to 1/2 inch from the top of the cloves, exposing the individual cloves of garlic. Place the garlic heads in a small baking dish, cut side up. Drizzle olive oil over each head and then using your fingers, rub oil over entire bulb. Cover dish with aluminum foil. Bake 25 to 35 minutes, until cloves feel soft. Next prepare the garlic-lemon ricotta spread by squeezing the garlic out of their skins; add to a medium sized bowl and mash with a fork. Add garlic, lemon zest, juice and herbs together with the ricotta cheese. Taste, season with salt and pepper, taste and season again if necessary. Remove squash from marinade and season with salt and pepper, grill on both sides turning frequently until fork tender. Remove from grill and cut into small pieces. Next grill bread slices lightly, both sides. 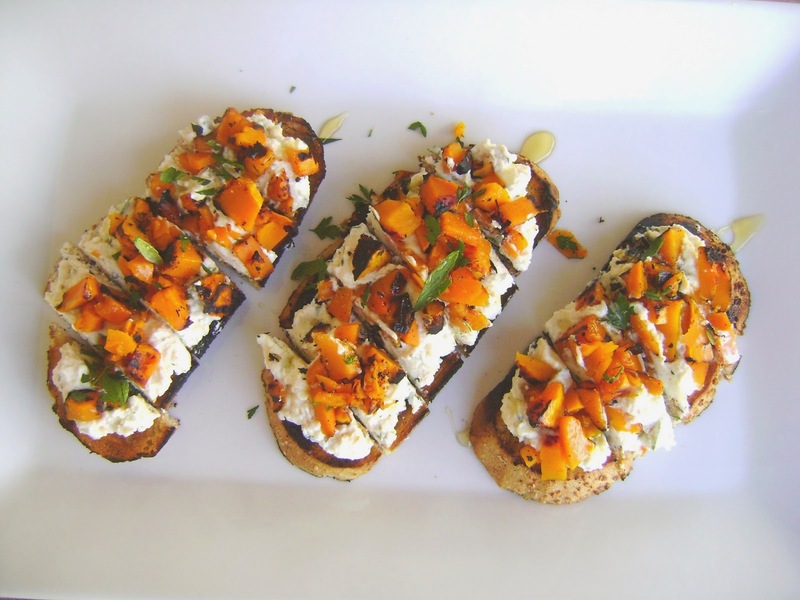 Spread lemon-ricotta bead on grilled bread, top with butternut squash, garnish with parsley and walnuts. Drizzle lightly with olive oil. This recipe has been slightly adapted from Chef Chrysa Robertson of the Rancho Pinot Grill. Thanks Helene, the red vinegar makes all the difference. Thanks Mila, appreciate the comment. This is such a creative way to use butternut squash. Love the way the garlic looks after oven roasting, very yummy. Hi Daniela, roasted garlic has a sweet flavor to it, thanks for stopping by. I have never thought of marinating squashes before roasting them. Must give this a try soon. These bruschetta look very delicious, Cheri. Hi Angie, that's what makes the flavors pop here, it's absolutely delicious! I've made a bruschetta with ricotta and lemon and tomatoes before and loved it, but adding butternut squash on top of the ricotta sounds just divine. I especially love that roasted garlic is squished in. And with walnuts on top ... mmmmm! Thanks Helen, roasted garlic is something truly glorious, happy week-end to you! Cheri those are beautiful, I love butternut squash and love your bruschetta. I think using ricotta was the perfect choice. The walnuts, roasted squash, walnuts and ricotta are a dream combination. Thanks Suzanne, we really enjoyed this! What a great idea to marinate squash. I am not going to forget about this because I love squash! Thanks Abbe, I know what you mean, I always roasted or steam squash, this was the first time I marinated, totally worth it. What an adventurous recipe, Cheri. I love it but my daughter is going to flip for it!!! she is always looking for new and exciting ways to serve butternut. Thanks Louise, this is a totally new way to prepare, but wait and see you will love it! Wow! your bruschetta looks simply amazing! Thanks Charlie, I do to, plus it is always a great place to meet others. This looks absolutely amazing. Wow. I love grilled/roasted squash and pumpkin - this would absolutely delicious. Thanks it was very tasty! I love bruschettas, such as a fun way to eat. Loving this fall twist on the Italian classic! Hi Mike, I love bruschettas too, this can be a snack or a complete meal. I would love to try your little masterpieces! I just waxed poetically, twice, about my love of ricotta on something similar. Great minds, Cheri! Thanks Francesca! ricotta is so versatile. This sure is a different and exciting way to serve butternut squash, must give this a try. Beautiful presentation. What a great idea, they look terrific - I never would have thought to use butternut squash this way. Hi Karen, I know right, usually I roast it, almost every time. Hi Sherry, I saw some black garlic at Trader Joe's the other day too, what would you make with it? Marinating the squash sounds great and I love bruschetta of all kinds so why not some delicious butternut squash! I love the roasted garlic, too. I am a big fan of bruschetta, and I love this colorful version–it sounds delicious! Thanks Pat, we really enjoyed this! That looks sensational..Perfect for fall.. This recipe looks scrumptious, Cheri. I'm always looking for ways to use my favorite butternut squash. Hi Cathy, butternut squash is one of my favorites too! Hi Cheri! Such a beautiful fall dish and a great new way to prepare butternut squash! Thanks Amy! fall is such a great time of year! Wow Cheri - this is something I would absolutely LOVE! Thank you for this inspiration and recipe. I just can't get enough Butternut squash these days. I think we eat it twice a week. I could make a meal of out these gorgeous little toasts! Hi Tricia, that's exactly what we did...with a green salad on the side. Thanks! These look amazing! I need to get more butternut squash in my life! Cheri all these steps must have made this one wonderful delicious tasting bruschetta! Trying soon! Thanks Ami, this was pretty good! I made something similar not too long ago that I'd eaten in a restaurant. The butternut (called pumpkin here) was roasted in the oven and was served with pesto and goats cheese and drizzled with balsamic vinegar. I'm dying to try yours now! Hi Maureen, your version sounds delicious, will have to try, thanks! The marinated butternut squash sounds amazing! Especially when used as a topper for bread and cheese. Mmm. I want this for lunch! Thanks Joanne, we really enjoyed it! Oh my - that marinated butternut squash is mouthwatering - I don't know if I could make it last long enough to spread it on the lemon ricotta smeared bread! Hi Shashi, confession....there was a lot of nibbles here and there before serving. Thanks Isadora, we had a small salad and it was a complete meal. I never thought to grill squash much less use it as a topping for bruschetta but I love the idea! What a great recipe and the restaurant sounds wonderful too. Thanks Susan, this was a really nice change. Will try this method again. Love this Cheri! A lovely fall dish - perfect for a party to share with friends! Thanks Grace, we truly enjoyed this! I have loads of butternut squash on my kitchen counter right this minute! And should use some of it in this -- I love bruschetta. But never had a squash one. That's gotta change! Thanks so much. Thanks John, bruschetta is one of our favorite nibbles as well. Dear Cheri, well, I love bruschetta and I love butternut squash. Thank goodness, markets and stores around here have started to sell these lovely squashes during the last few years. So, this would be one savory treat that I could not resist munching on, that´s for sure! And such a lovely presentation too! Thanks Andrea, we love the combination of the squash and bruschetta too! So creative and so pretty! Thanks Leah, it was delicious! Cuteness matters, and you've got it DOWN here. Thanks Jessie!!! appreciate you stopping by. Thanks Dedy!!! happy week-end to you! What a fabulous bruschetta! This one is happening here in the very near future! I really need to visit farmers markets more often! Thanks for sharing. Thanks Gwen!! loving the cooler mornings now here in Phoenix! Wow, that is something so different it works. Thanks Cheri for sharing your lovely recipes. Have a great weekend. Thanks Linda, you are so sweet. Happy week-end to you too! This sounds incredibly flavorful and delicious Cheri! I can't wait to roast my first butternut of the season tomorrow! Thanks Reeni, can't wait to see what you make! Hi David, Venice is on my list, sounds wonderful.